Currently viewing the tag: "provincetown"
Sean Flood is a former street artist turned fine artist and somewhat of a local celebrity in Boston. 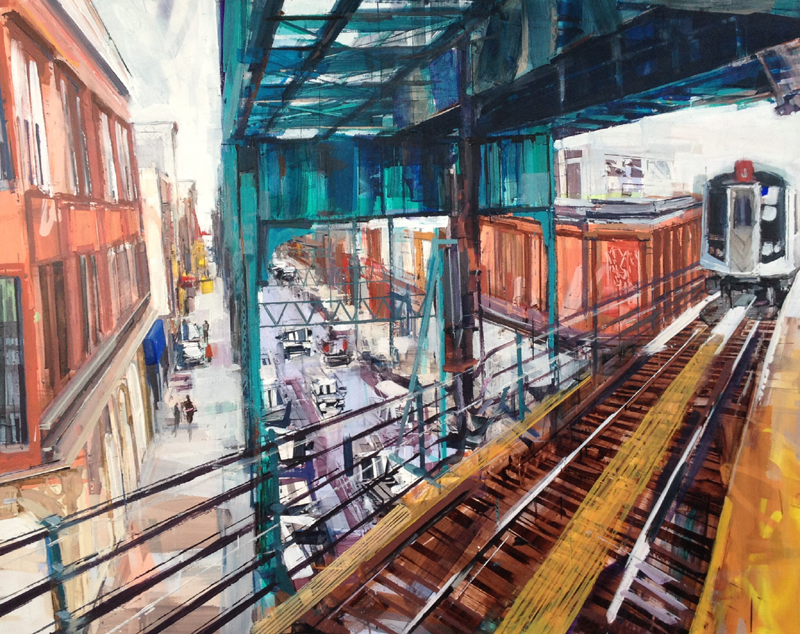 His dynamic paintings of urban scenes and cityscapes are a reflection of his roots in construction and graffiti art. 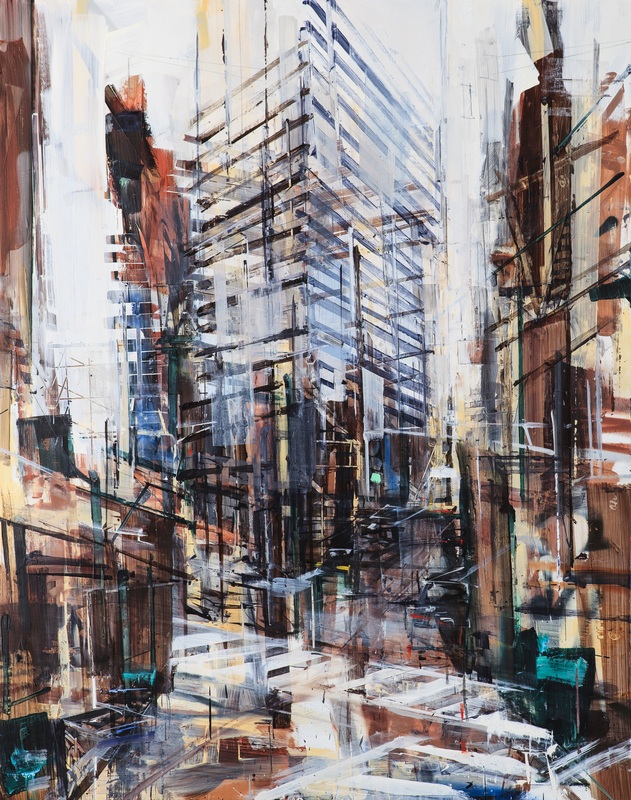 Flood harnesses the inherent intensity of graffiti, using line and form to build his paintings like the high-rises he depicts. 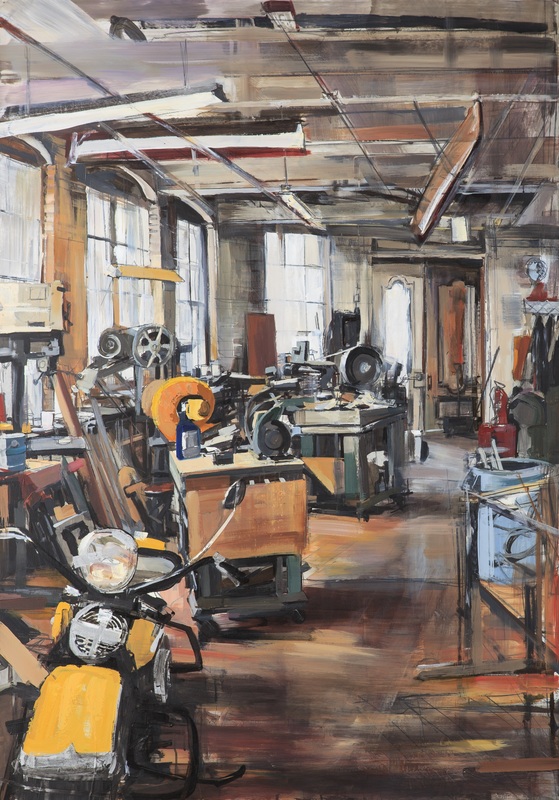 Fresh off two very successful solo exhibitions at Kobalt Gallery in Provincetown and Childs Gallery in Boston, Sean sat down with us to discuss his art, his experiences, and his musings on how he got started as an artist. HOW OLD WERE YOU THE FIRST TIME YOU PICKED UP A PAINTBRUSH? AND A SPRAY CAN? I was a pencil guy from an early age – drawing as young as 8 years old – because painting scared me. I actually had my first show at 9! The Priscilla Beach Theatre [in Plymouth, MA] hosted a show – so it was coffee and hors d’oeuvres and then my doodles and cartoons on view. I picked up a paint brush and a spray can – both probably around 15 years old. WHAT WAS THE MOST EXCITING ASPECT OF BEING A GRAFFITI ARTIST? Oh, definitely the rush of trying not to get caught. Then seeing it the next day, knowing you had gotten away with it. There’s a speed to graffiti art. DID YOU EVER GET IN TROUBLE WITH THE AUTHORITIES FOR YOUR GRAFFITI ART? Yes. I’ve been arrested three times, spent a couple of nights in jail, paid fines, had a probation officer, etc. One time I was painting the pier on Old Orchard Beach in Maine, during a camping trip, and I’m painting away and don’t notice a cop next to me until he taps on my shoulder. I had to do community service sometimes. One of the best punishments I got was painting a mural for Boston City Lights – a dance studio in the South End. That was a great gig for a graffiti artist. WHEN DID YOU DECIDE TO MOVE FROM GRAFFITI ART TO FINE ART? It was really about getting caught, and I moved to painting to try and stay out of trouble. I was good at graffiti art, bad at getting away. Graffiti art continues to influence my technique though. At first, I would try to include hidden graffiti in each of my paintings, but now I just take inspiration from the quick technique and shapes of graffiti. Sean Flood, American (b. 1982), Approaching Kenmore, 2013, Oil on panel, 26 x 28 in. 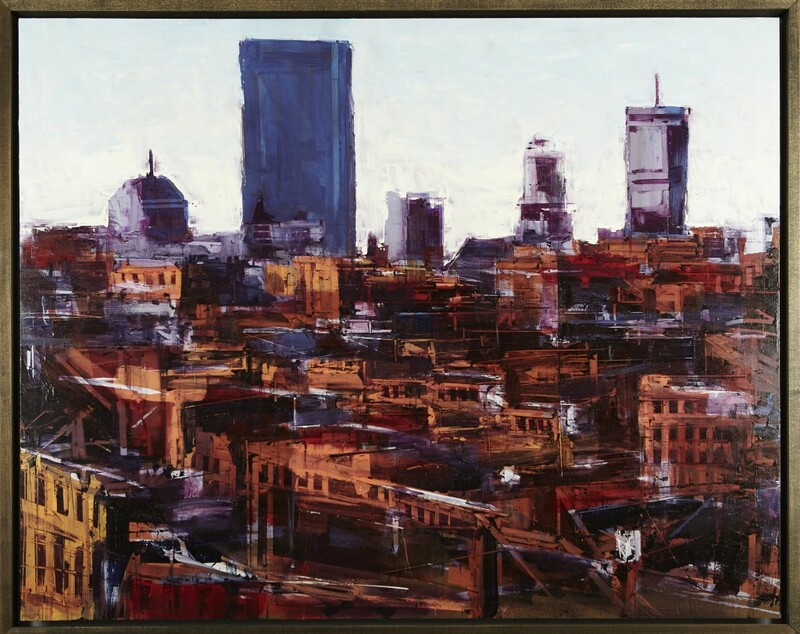 WHY CHOOSE THE CITY AS THE PRIMARY SUBJECT OF YOUR ARTISTIC IMPRESSION? AND HOW HAS YOUR EXPERIENCE IN CONSTRUCTION INFLUENCED YOUR ARTISTIC VISION? I’ve always been interested in buildings. My dad has been a builder in Boston his whole life. For me, growing up with that and working with him over the years has really drawn me to architectural subject. The perspectives and deep space alone excite me. 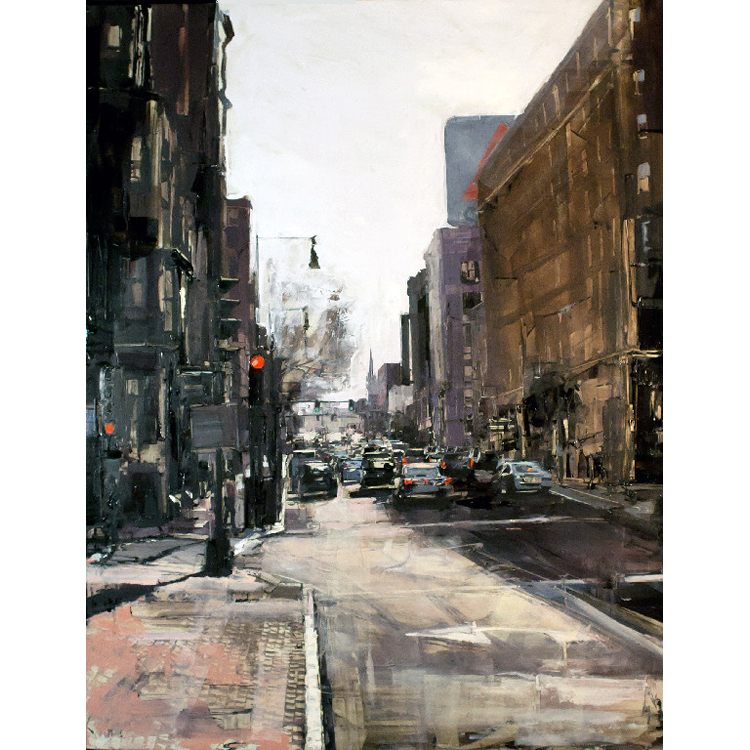 In school, I tended towards figurative painting, but nowadays, I’m more drawn to cityscape paintings – there is more room there for me to develop ideas than with figurative painting, for now…. 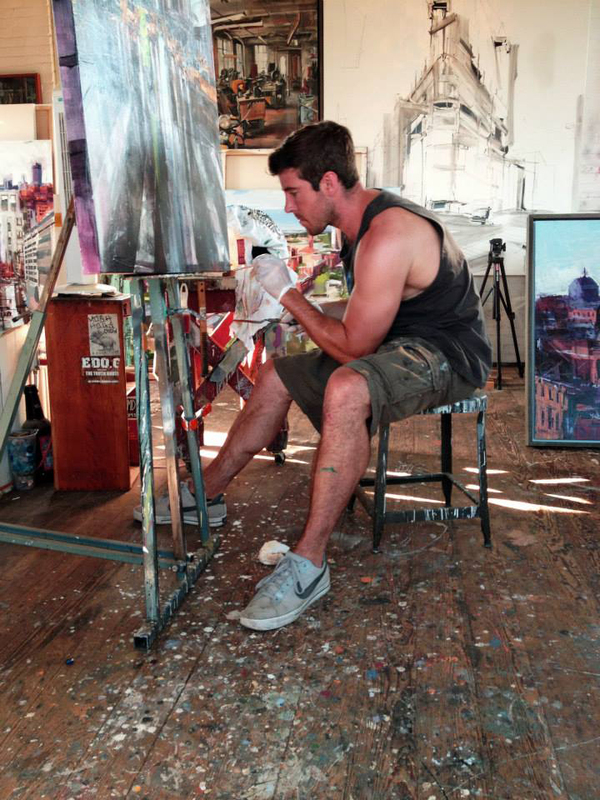 DO YOU PAINT FROM OBSERVATION OR IMAGINATION? When I started out doing graffiti, I was focused on using the alphabet, and these raw, expressive marks. 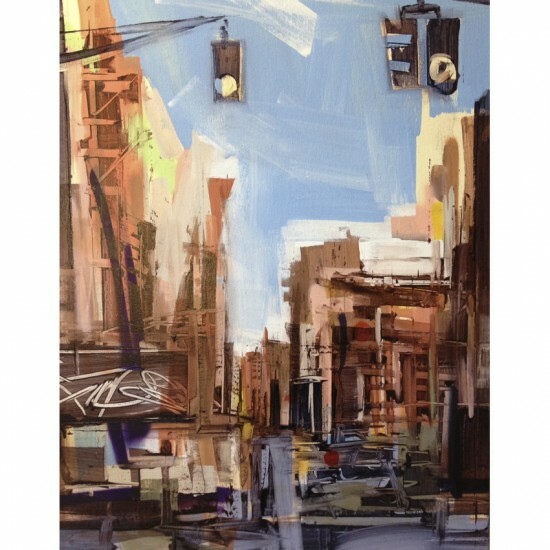 With my cityscapes, I’m trying to infuse some of that same expressive abstraction into my observed settings. Actually, right now I’m working on some paintings that are much more of a fleeting glance of a scene, a quick impression. There’s more room for imagination there. WHERE WOULD YOU SAY YOUR ART IS GOING NOW? In the short term, I’m hoping to get some inspiration from an upcoming trip to Europe. I’m headed to Rome, Naples, Venice – for the first time, Umbria, Basel and Ireland. I’m going to see the shows while I’m travelling – the Biennale for example, but also I’ll hopefully get a chance to paint some new places for me. Sean Flood, American (b. 1982), Little Italy NYC, 2014, Oil on canvas, 28 x 22 in. In school I always liked Giacometti [Alberto Giacometti, 1901-1966], because of his expressive lines. He builds up forms through all of these different lines. He’s tall, smart, athletic, and handsome, has a quick wit and a winning smile — exactly the kind of guy you’d picture as a Senior Vice President in a big company — not the kind of guy you’d picture as having a potentially disabling disease. Liam Kennedy, 39, a Babson College graduate and soccer player was living his dream six years ago. He had a great job at Bain Capital in Boston, a lovely wife-to-be, Jennifer, loyal family and friends. Then he found out he had multiple sclerosis.